You "wear your chair" more than any article of clothing you own. Better get a good fit. 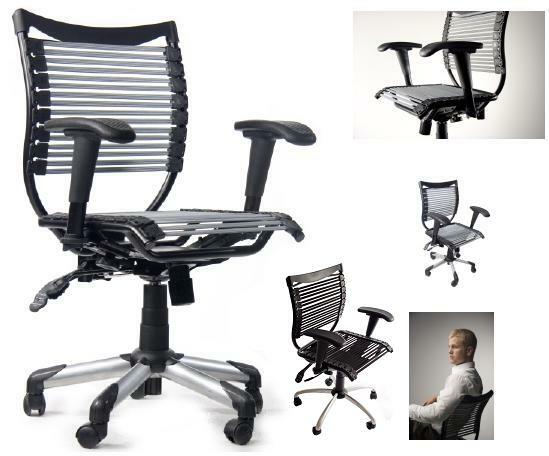 Seatability chairs conform to your body with dimension-specific technology. The unique elasticity system curves around your body structure, transferring ergonomic support to high stress areas. This Bungee Band Office Chair allows you to feel the comfort of multiple bands supporting your weight. The bands also serve to distribute the weight evenly giving you maximum support to your back and hips. Unlike other office chairs made from leather or fabric, this bungee band office chairs allow air flow to your back and legs to help avoid the discomfort from sitting at your desk for extended periods of time. This office chair frame is steel reinforced. The heavy duty structure has an attractive look and will last you for an extended period of time. timatdec Great Product and an EXCELLENT Seller. Very Highly Recommended. Thanks! joeflyer59 I *love* this chair. Well constructed and great for my back! Thanks again! chjfds Excellent product, couldn't be better. Dimensions: 25" x 23" x 9"